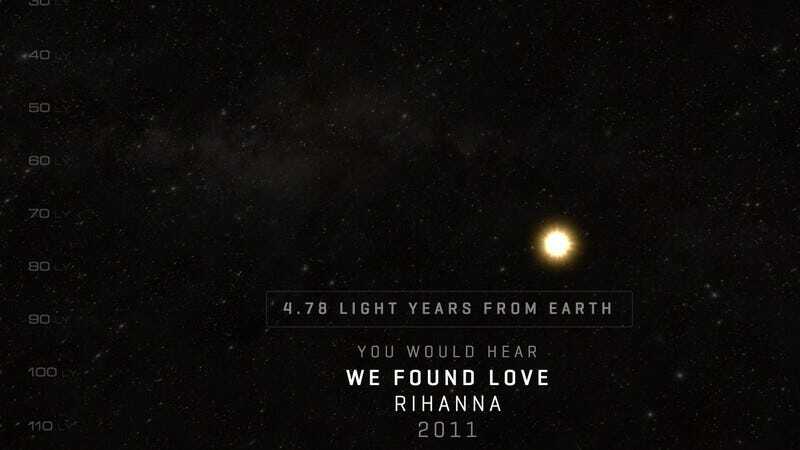 Inspired by the opening credits to the 1997 sci-fi cult classic Contact, Lightyear.fm is a web-based experiment that lets users take a trip through the solar system–and beyond–set to the popular music deep space voyagers would be hearing as they got progressively further away from the Earth. The asteroid belt is just getting “Uptown Funk” for the first time, for instance, while Proxima Centauri is hoping that no one sees them loudly singing Adele’s “Rolling In The Deep” with the car windows rolled up. The extraterrestrial journey goes as far as 120 light years away from the earth, relying on the resources of the massive Usenet-based music history and preservation database the Whitburn Project. Unfortunately, both Contact’s opening minutes and Lightyear.fm rely on a scientific suspension of disbelief: In reality, radio waves would dissipate into background noise a mere handful of light years away from our sun. But it’s much more fun to pretend that Wolf 437, where Guns And Roses’ “Sweet Child of Mine” would be airing, is just getting out of its hair metal phase.